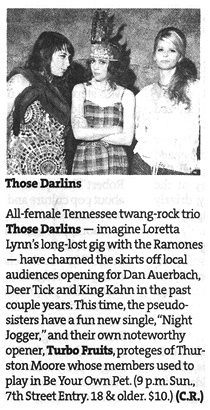 Those Darlins came to town, and doing the things they do best: singin', drinkin', swearin', and havin' a good great time. Warming up the audience was Henry Wagons, of Wagons, he was a delight to listen and watch. He's from Melbourne, but apparently was heavily influenced by American Country music (of the Kenny Rogers and Willie Nelson variety). He spoke after each and every song, which I did not mind because they're all pretty hilarious, what he has to say. I think Wagons would make a better comedian than a country singer, I don't know what that says about his singing career, but he definitely is an entertainer. Turbo Fruits were four young lads, who were loud rock music, sometime even punkish sounding. This actually doesn't surprise me, because I've previously seen the band in their earlier incarnation as Be Your Own Pet (who actually deeply impressed me more than Arctic Monkeys). One thing I'd like to mention is that I could not, for the life of me, understand a single word singer Jonas Stein said. It would be "mummblbe mumbble whiskey mumthankee". Thankfully someone else understood him, and bought them a round of whiskey. Those Darlins came on stage about eleven, and by this time, the small 7th Street started filling up. I saw a lot of familiar faces, but some new ones as well. I'm assuming the new faces were there to see what all the buzz was about, especially since the band got a nice brief writeup in the Star Tribune newspaper. I should also point out that the band now has an extra guitar player called Shane Spresser, who was there to fill in for Nikki's arm. I did get a chance to look at her arm, they cut a straight line along the center to draft the metal pins, as seen on the cover of Night Jogger 7", which incidentally I picked up at the show for $5. Anyway, the first set was mostly new songs. Fortunately, they played "Cannonball Blues", in the middle of the solid eight new songs. So it's understandable that the audience was still trying to follow the songs. Of the new songs, I was keen on "Hives". The old fans started warmed up to the second set, when the familiar songs started trickling in. It started with "Wild One", and it just build and build from there. Big crowd pleasers were "The Whole Damn Thing" aka "The Chicken Song" (which, incidentally, was not on the setlist) and "Red Light Love". Officially, the setlist ended with "Night Jogger", which sounds awesome live, as expected. But the fun didn't end there. The band didn't even do that fake "leave and come back for the encore" thing, they just kept playing. From what I can remember, the encores were "Funstix Party" and their signature outro song, "Shakin' All Over". So fun, see you next time gals.